I was at a picnic not too long ago and someone had brought this old-fashioned salad along. You wouldn’t believe how fast it went. Sometimes these simple, old-fashioned recipes really hit the spot; they’re almost a welcome relief! Of course, I had to show it to my to my son and his girlfriend. It’s a great little recipe to have on a hot summer’s day for home or to bring somewhere. Best of all, there’s not much to it and if you can boil noodles, you can make it! By the way, if you’re new to boiling noodles, read the chart on the back of the box or bag, use a bigger pot and more water than you think you’ll need, cover the pot when heating the water (it gets up to a boil a bit faster) and gently stir as the noodles go in and after it comes to a boil so they don’t stick to the bottom. A flat spatula is great for this! Once the noodles start to boil, turn the heat down to a simmer and watch the pot so it doesn’t boil over. The timing starts when the noodles begin their boil, and if the pot looks like it will overflow, usually a quick stir and turning down the heat does the trick, if not nudge it off the burner for a minute. When you think they’re done, test a bit early, and test more than one noodle! But back to the salad – it doesn’t hurt either that there are a few easy ways to modify this recipe. It can be made as a side with just the macaroni, dressing and vegetables or made into a Tuna & Macaroni Salad. If you’re young and starting out, canned tuna can be a great budget item. It’s regularly on sale for about 59 cents a can in my area. I often see this salad with little to no vegetables, but I think it’s best made with as many as you can add and still have it hold together! Celery, Green Peppers and Onions are always inexpensive; Red and Orange Bell Peppers are prettier, but usually a bit pricier. This recipe uses ground mustard, which I think makes the recipe, but a little ballpark or Dijon could be substituted. Cook Macaroni al dente in salted water according to package directions. Rinse immediately in cool water and drain well. Add to a large bowl. Add celery, onion, pepper, green onion and hard-cooked eggs. Toss together. Add in tuna if using and gently toss. Mix Dressing ingredients, Mayonnaise (or mayo/yogurt mixture), vinegar, pickle relish, if using, mustard powder, sugar salt and pepper. Combine gently with Macaroni mixture. Refrigerate. Best if refrigerated for about an hour before serving. If mixture becomes too dense, add a little extra mayonnaise or a tablespoon or two of water to loosen the consistency. This entry was posted in Click here for Bargain Meals, Click here for Fabulous Food Posts and tagged Bell Peppers, Easy Recipe, Eggs, Frugal Hausfrau, Green Onion, hard-boiled eggs, Pasta, Red onion, Salad, Tuna. Bookmark the permalink. Love the idea of pushing the eggs through a cooling rack! Thanks Liz! It’s really easy! Question for you … have you changed the name of your Blog to Frugal Feeding or, is Frugal Feeding a different blog altogether ?? No they’re a different blog altogether. I think it’s a great blog, though. But … don’t you write them both ?? There’s nothing better than a good old fashioned macaroni salad! I actually don’t have a go to recipe, but do now! Thanks, Sarah. I usually give it about an hour in the fridge (if we can wait that long to eat it) and then decide if I want to tinker a bit with any of the flavors. Thanks! It was fun to revisit a forgotten favorite! Ah, yes, those days. I remember my room mates and I looking at four potatoes and a bottle of ketchup and trying to figure out what to make! And we certainly had our share of macaroni! I’ve been doing the same thing to my green onions! And now I even poke them in a pot of dirt. Isn’t it brilliant?! 😃 Love macaroni salad, with lots of eggg, just like yours! Thanks so much! 🙂 It hit the spot! Cool and creamy always hits a comfort note for me! Unless it’s hot and creamy like mashed potatoes or mac & cheese! 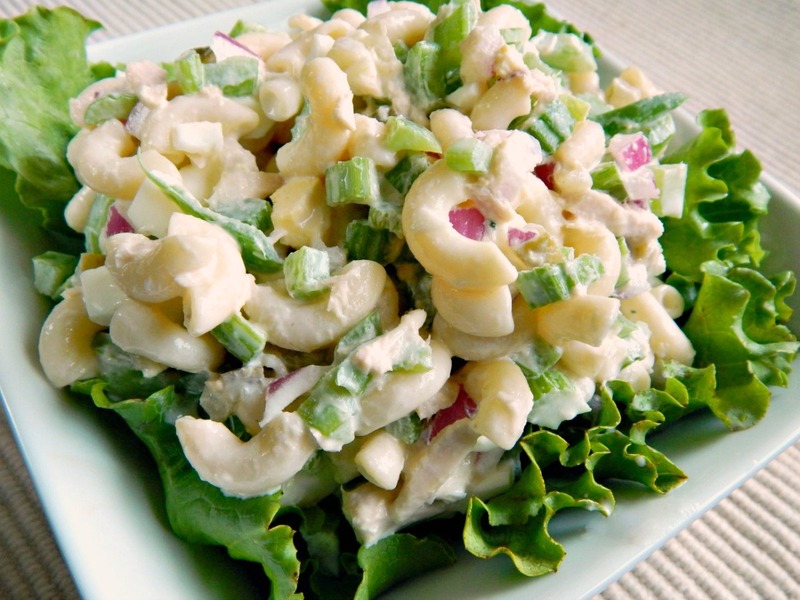 I love macaroni salad and agree that the more veggies the better! It makes them prettier and delicious! What a great summer dish. Thanks, Julie, I’m sure all of us good Midwesterner’s grew up on them! 🙂 Maybe all North Americans? Of course one of the fun things about blogging is that just like I see new to me recipes everyday, I’m sure this will be new to someone else, right! Love this recipe, so many different flavors going on. Will definitely be trying it out soon. Hey, I made those chicken meatballs of yours again over the weekend! I am SO in love with them! Gosh, I don’t believe we should just post gourmet meals? Wait till you see what I will be posting tomorrow – a child could attempt to make it. Is it the curried chicken meatballs? Great stuff! You called them Molasses Lime Chicken Meatballs. They’re fantastic! Ahh yes, those meatballs….they are yummy too! Tell me, do you serve these as an appetizer or a main meal over noodles or rice? I eat them as a main meal with rice. I’ve been making them into little patties which is my lazy way of not having to turn the meatballs to brown on all sides! Yes, I did; still not sold on it yet, though! I love macaroni salad, it’s one of my favorites and a real classic. I also love to make macaroni, mayo, tuna and peas ( I like canned le seur peas for this) I will try this macaroni salad. Thanks! I do sometimes add peas to mine and I’ll have to check out the le seur; if memory serves those are the petit ones? I like to add canned peas to this with tuna. Or with any vegetable out from the garden. Thanks so much for the reblog! I love this with peas, too! This looks delicious. I love a good macaroni salad. One question: how do you get your eggs to hard-boil so nicely. Do you have a post where you explain that? I’d love to know. Never mind, the request for an answer to my question. I saw the link you posted. I should pay closer attention! Yeah, it was a “new” discovery for me! I think the biggest thing though is to use not so fresh eggs if possible. The combination of ingredients ends up with a colourful and tasty looking salad.